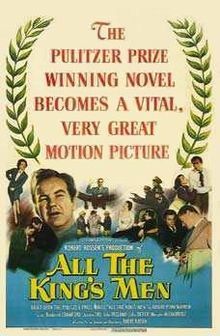 For some reason I had never seen the classic film All the King’s Men (nor have I read the novel, for that matter, although I’ve owned a used copy of it for decades). But I finally got around to watching the excellent original (1949) version of the movie (not the 1971 remake which was not well received). You can see in the movie poster that the publicists were none too modest about this “vital, very great motion picture,” but I can live with the hype if only they would drop the “very” — a minor complaint. Anyhow, the common assumption is that both the novel and the movie are really about Huey Long, late governor and senator from Louisiana, fictionalized here as Willie Stark, governor of an unnamed southern state. I can’t know how much you know about Long, but I can tell you that most of my knowledge derives from the Andover bias of an APUSH class. The movie then pushed me to do some Internet research of my own. My first disturbing thought on seeing All the King’s Men was that there was a lot that was attractive about the fictionalized Long. The reason it was disturbing was the cognitive dissonance set up by the knowledge that this corrupt populist was actually (both in real life and on screen) a liberal Democrat, despite all the clear similarities to Donald Trump. His rallies, as portrayed in the movie (and apparently correctly so), were more than slightly reminiscent of Trump’s rallies; his corruption and his attitude toward the press were likewise; and his pandering to low-income voters seemed very familiar. And yet, as I say, there was something I liked about him as portrayed here. A probably accidental similarity is the almost-100%-white nature of Stark’s supporters; I say it’s probably accidental since in fact Long had many non-white supporters, as you would expect of a liberal in the South. Go look it up, if you don’t know what I’m talking about. The movie, by the way, is very well done, so you can just appreciate it as an excellent film (even if not a “very great motion picture”) without worrying about historical comparisons, past and present. Clearly the novel was inspired by Huey Long, although it was never meant to be historically accurate. You can nitpick the dozens of discrepancies if you want, but that’s not the point of either the novel or the movie.